As some of you may or may not know, my birthday happens to coincide with America’s: the 4th of July. You may have also noticed that there are longer gaps in between my posts. I have been working more and writing less. My apologies. My sincerest apologies if you look to my website for regular, entertaining material. America has historically produced the shitties of all vodkas. Think SKYY, or far worse, Popov. Russia has tasty potato vodkas like Stolichnaya. The Brits make Smirnoff and Three Olives from grain. France and the Netherlands have high-end wheat vodkas like Grey Goose and Ketel One respectively. The Swedes also have wheat-based vodkas like Absolut and…Svedka. In attempts to unwind, many nights of late have been destroyed by the most American imported Swedish vodka, Svedka, although I have been known to blame olives, cranberry juice and tonic water. Undwinding becomes totally unwound. It takes its toll on both writing and editing; writing proves itself to be garbage and editing does more harm than good. My standards of practice are sure to improve after my week-long birthday extravaganza comes to an exhausting end. Svedka’s new co-branded/flagged marketing campaign is ingenious. 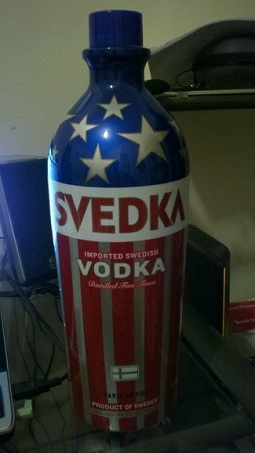 I’ve never felt more patriotic drinking an imported liquor. In birthdays past, I was shotgunning American flag cans of Budweiser. Now I can leisurely sip a martini or vodka tonic and think to myself: “God dammit, I’m American!” I simply have to limit the devolution from sipping to guzzling. And somebody has to keep me away from the olives. ← You Can Have New Jersey, Bruce. We Want America Back.